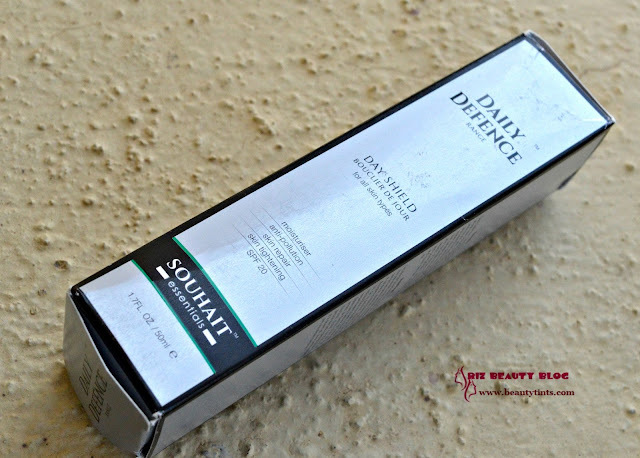 Sriz Beauty Blog: Souhait Essentials Daily Defence Range Day Shield Moisturizer Review!!! 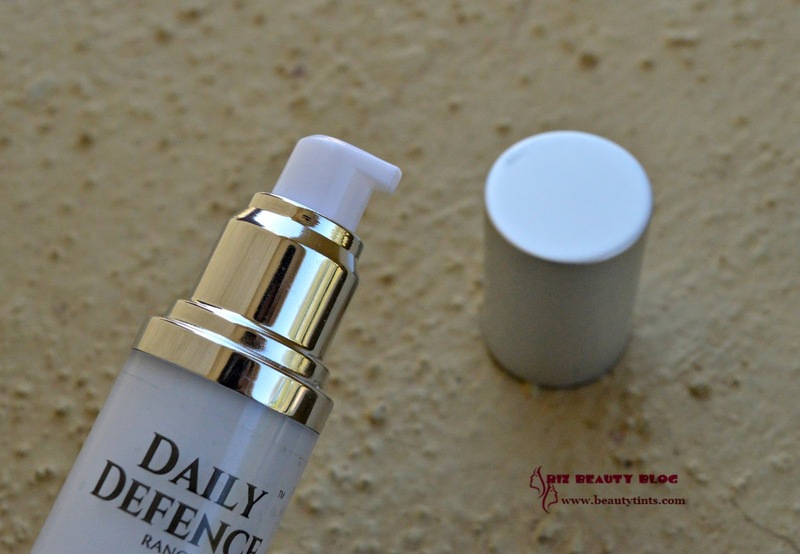 Souhait Essentials Daily Defence Range Day Shield Moisturizer Review!!! 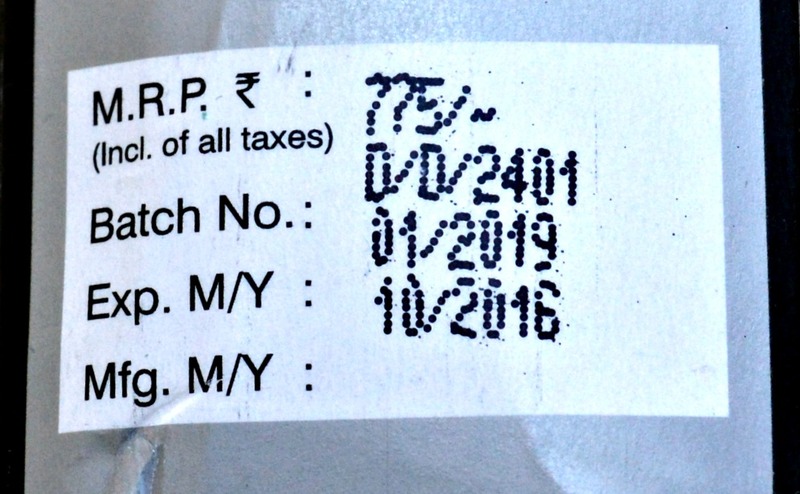 Today I am introducing Souhait Essentials with a review of their Day Shield Moisturizer from their Daily Defence Range, which I have been using from past few weeks.This day shield moisturizer is a paraben free lightweight cream with SPF 20.Read the complete review to know how it worked for me! About the Brand : Souhait Essentials is a wellness brand that offers complete protection to your skin, body and hair. The brand is a result of extensive research and innovation, which allowed its promoters to envisage an enviable range of products that focus on the complete well being of one's body and hair. Drawing its inspiration from the word 'Souhait' which means 'Wish' in French, Souhait takes its first step with the “DAY SHIELD”, its debut product under the “Daily Defence Range”. This line of products is part of the premium-economy cosmetic range for the brand. 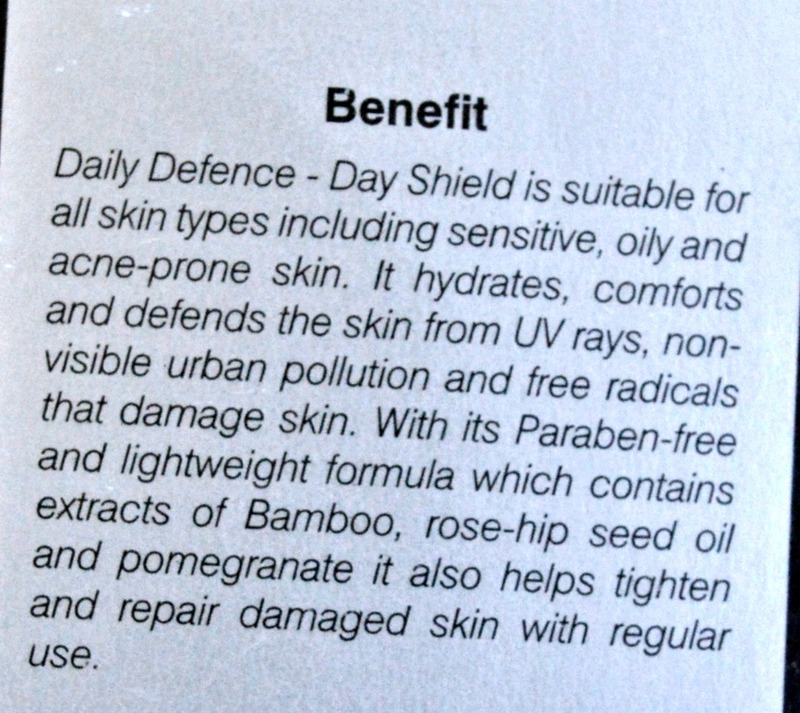 The Day Shield cream will act as your perfect day partner curbing the adverse effects of urban pollution on your skin. The brand soon plans to add a lot many products under the Daily Defence Range - there would be products for hair, Instant relief,Ageing, Under Eye area, Micellar, Anti Pollution Wipes and for kids in the coming months. Souhait Essentials firmly believes in the ethos of natural and sustainable products which are rich in natural extracts are smooth and soft textured products. It focuses on exotic and rare ingredients like rose-hip oil, bamboo extracts, cold pressed almond oil, carrot seed oil to name a few. With the desire to bring high quality and safe cosmetic products for the uber chic, the brand offers safe and effective cosmetics products across skin care, hair and body segment for all genders and age groups. You can check out more about them here. 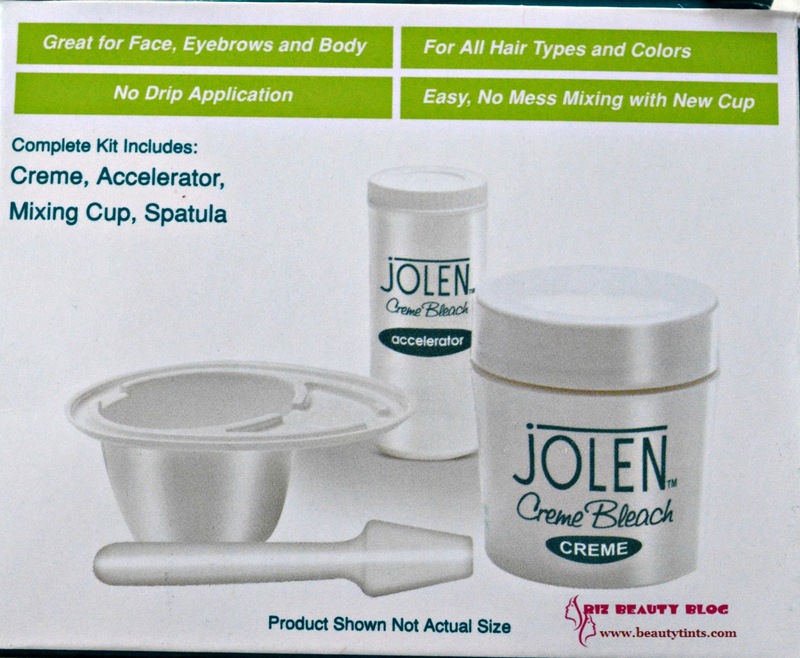 Packaging : The moisturizer comes in a classy glass tube with a pump dispenser and a cap. 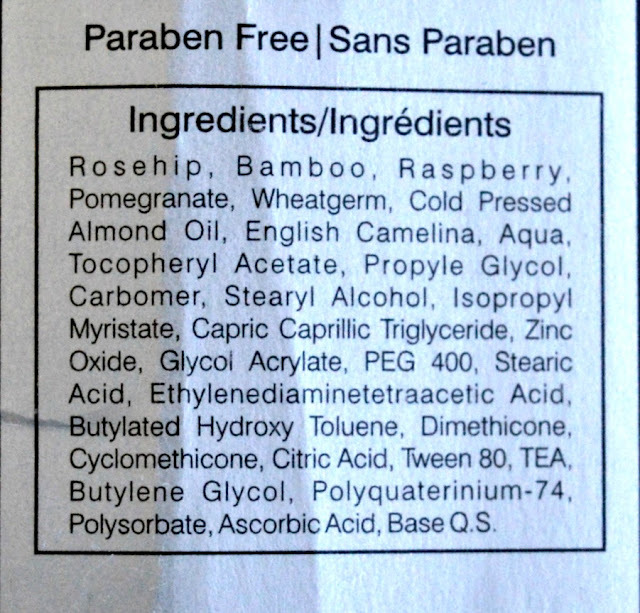 Ingredients: Rosehip, bamboo, raspberry, pomegranate, wheatgerm, cold pressed almond oil, english camelina, aqua, tocopheryl acetate, propyle glycol, carbomer, Stearyl alcohol, isopropyl myristate, capric Caprillic triglyceride,zinc oxide, glycol acrylate, PEG 400, Stearic acid, Ethylenediaminetetraaxetic acid, Butylated hydroxy toluene, Dimethicone, cyclomethicone, citric acid, Tween 80,TEA butylene glycol, polyquaterinium -74, polysorbate, ascorbic acid, Base Q.S. 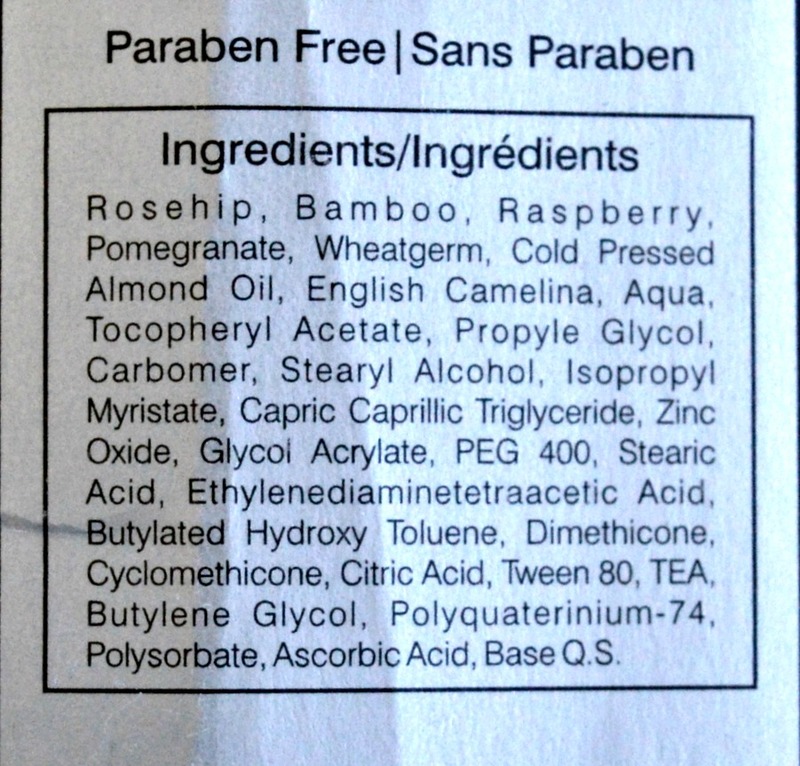 What The Product Claims : It's a Paraben free, light weight day cream with SPF 20 and natural extracts of Bamboo, Rosehip Seed, Pomegranate, Cold Pressed Almond Oil, Raspberry, English Camellia and many more to hydrate, comfort and defend skin from UV and harmful radicals of Urban Pollution. 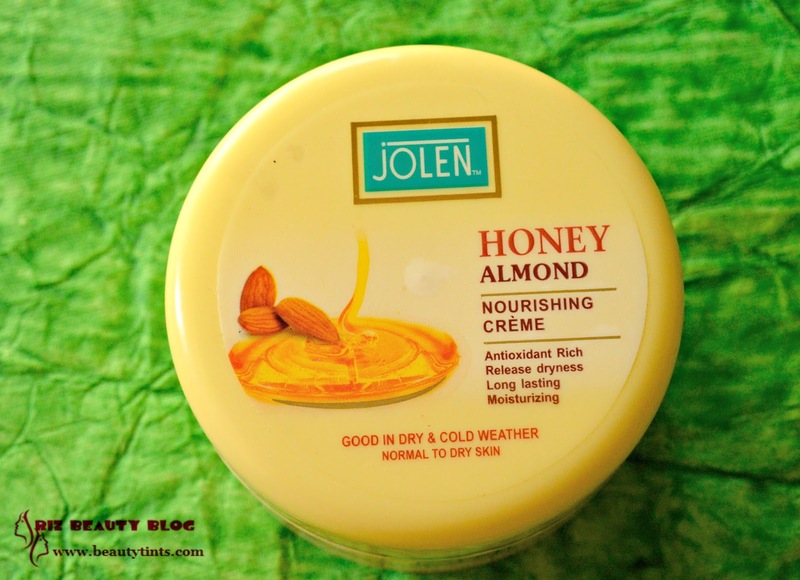 It also repairs and tightens damaged skin for younger and supple finish with regular use. Day Shield will work as a multipurpose cream which will help you to save your time and guard your skin against the beauty woes all day long. Directions: Apply to the cleansed skin in the morning, at least 15 minutes prior the sun exposure.Use upward sweeping motions,apply to face and neck. My View On the Product: I have been using this moisturizer for past 2-3 weeks and I have been loving it from the first day itself.The first thing I liked is the packaging, it is very sturdy and stylish.The pump dispenser dispenses the right amount of product without wastage.The cream has a moderate consistency and it spreads easily on the skin.It has a super refreshing fragrance, which I love. 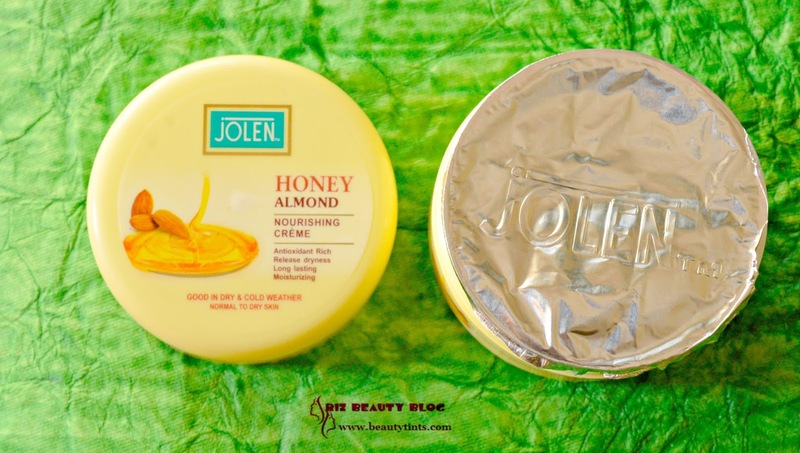 This is a multi-purpose cream which moisturizes, nourishes and protects the skin.It doesn't feel heavy yet hydrates the skin well.It comes with SPF 20 and it protects the skin from harmful UV rays.It doesn't give the white cast to the skin.It also acts as a good makeup base.On continuous usage, it makes skin smooth and supple.It is enriched with the goodness of natural extracts of Bamboo, Rosehip Seed, Pomegranate, Cold Pressed Almond Oil, Raspberry, English Camellia etc., which helps in making the skin smooth and young.The best thing is it is paraben free.Though it is priced a bit high, but it is all worth.It suits all skin types but extreme oily skin people may feel it a bit heavy for their skin in summers. 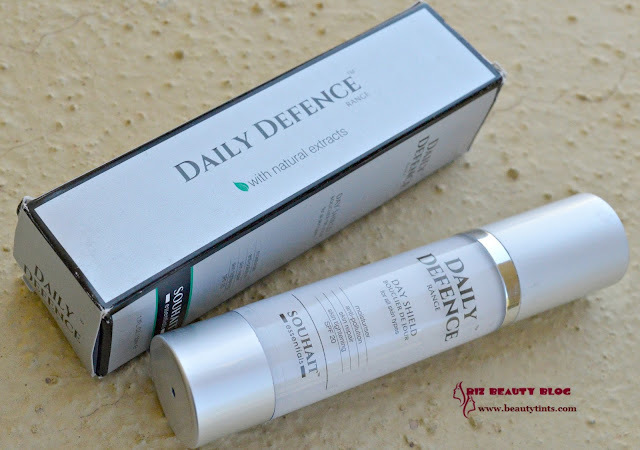 Final Conclusion about Souhait Essentials Daily Defence Range Day Shield Moisturizer: Those who are looking for a multi-purpose daily moisturizer which can take care of most skin issues should not miss this wonderful cream!